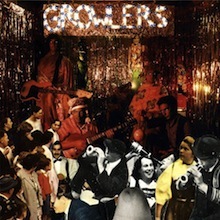 The Growlers :: Are You In Or Out? I’m bothered by records whose alternation of sound between tracks renders it unlistenable in a single sitting. A good flow between songs, even if one is a rock opus and the next a gentle ballad, is not only conducive to an overall enjoyable listen – it’s a prerequisite for the construction of a great record. The Growlers know this, and on Are You In Or Out? take this creed a step further, creating a record consistent in sound and tone that is as enjoyable straight through or on shuffle. The record drives on at a pace not measured in speed but in sound – even slower tracks like “Wandering Eyes” and the most folky of them (“Lenny Sinpablo Juliano 36th”) have a sudden urgency to them. Brooks Nielson’s vocals on tracks like “Something Someone Jr.” push the band forward, striving to push the songs faster. But when the music does win, and Nielson’s voice reaches a strained chop (and that’s a good thing here), Brian Stewart’s waltzy drums make even the slowest tracks a woozy head-bobber. MP3: The Growlers :: Something Someone Jr.